You’re looking at day six of our Rainbow Week series. Click here to start on day one. Well, we’re nearing the end of Rainbow Week! 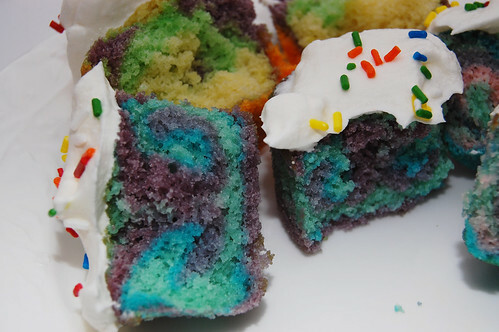 We hope you’ve learned some new things and that you have plans this weekend to make lots of colorful rainbow treats like today’s post – Pastel Tie Dye Cupcakes. Back in the day I loved tie dye – and let’s be honest, I still do. 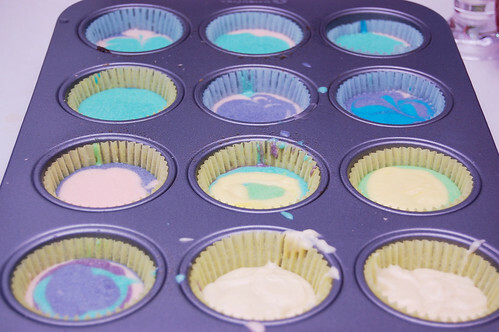 Making rainbow cupcakes like these can even be more fun than rainbow cake because each individual cupcake can have a unique pattern – colored layers, marbled/swirled batter, just color in the middle, etc. 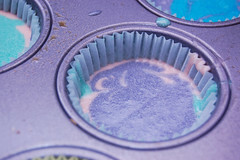 I used pastel purple, teal and pink, along with a few other colors, in yellow butter cake batter. 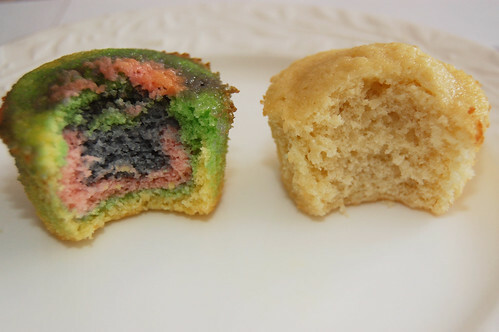 I was also able to do a little test, baking regular cupcakes alongside rainbow cupcakes to see how the color affects the batter. 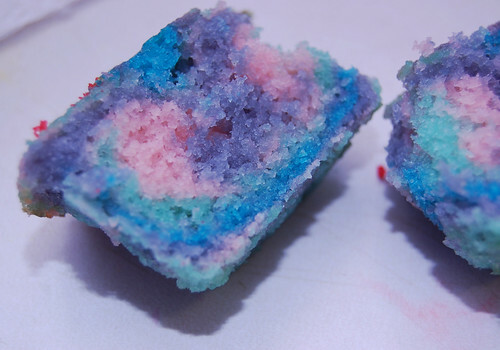 The answer is, as I believe Edwin mentioned and as I found out, that the color does affect the batter, particularly this time. Pastel colors, because they’re lighter, require more gel. 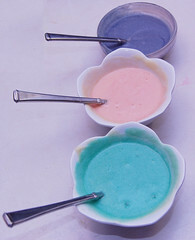 Whereas Edwin and I use only a small amount of primary color gel for the rainbow cake and rainbow cake cones, I had to use the whole tube of pastel color gel to color the batter – oy! All the stirring needed for pastels unfortunately makes the cupcakes more dense. So I might recommend sticking with primary color gels for the best tasting cake, although the teal color did turn out pretty cool! I used the same Williams-Sonoma yellow cake recipe here as I did for the cake cones. If you don’t have the Williams-Sonoma “Desserts” book, I would recommend this recipe available online by Martha Stewart for a basic yellow butter cake, adapted from “Martha Stewart’s Baking Handbook.” It is very similar to the one I used. A box yellow cake mix will also work. To frost the cupcakes, I used a light and fluffy fat free Cool Whip. A Seven Minute Frosting would also work well. 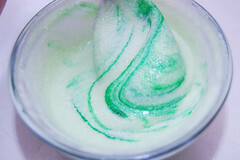 Anna at Cookie Madness has a good recipe for Seven Minute Frosting, and Joy the Baker has a Seven Minute Frosting that you can make pink or green (just in case you want even more color for your cupcakes!). 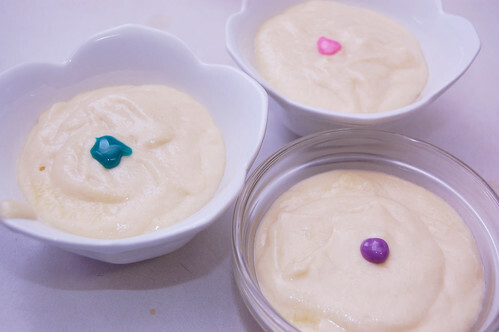 In case you missed Edwin’s detailed instructions on “How To Make Your Own Rainbow Cake” earlier in the week, please check it out for very useful tips and advice before you begin.